Viva Guillaume Long, King of Madrid! 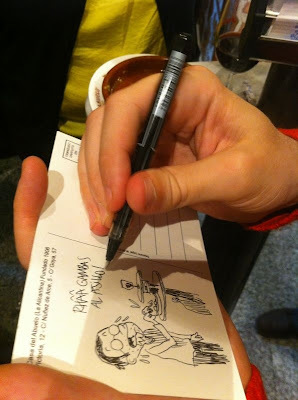 A pretty blurry photo of the wonderful postcard that Guillaume sent us from El Abuelo. Wow, wow, wow. I take it all back. Oh my, yes, I am honored. But now I'm hungry again too. Be sure to check out this great chronicle of Guillaume Long's visit to Madrid, to present his book A Comer y A Beber (Ediciones Sins Entido), on his fantastic and hunger-inducing blog in Le Monde. 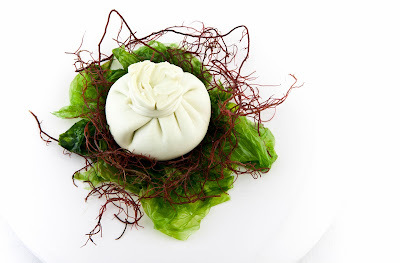 Burrata Marina by Ángel León of Aponiente. Photo by Álvaro Fernández Prieto. Madrid Fusion came and went again this year, leaving me with a bunch of blurry photos taken with my iphone and a notebook full of impressions that I am little by little hoping to share. Last week I had the pleasure of presenting the newly released book A Comer y A Beber (Editorial Sins Entido) by Swiss illustrator and food enthusiast Guillaume Long. I am ashamed to say, however, that after a hectic week of food, food and more food presentations at Madrid Fusión, all I can think of to say right now is, "It is a great book, you should buy it"; but at the time, like the studious gal nervous for her first book presentation that I am, I prepared a list of some of the highlights from this fantastic gastronomic-comic. - This book made me very hungry and also made me want to go to the market and then start cooking. 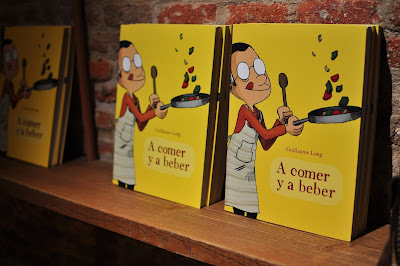 - It is not just a comic book about food, or a cookbook with illustrations. It is also a dictionary of food terms, an encyclopedia of interesting facts about things like vegetables abd regional cuisines, an autobiography, a guide for where to eat in what city and an emotional roller coaster of Guillaume's culinary triumphs and defeats. - It has a back page that you can tear out and hang up in your kitchen showing fruits and vegetables classified by season. It would be very useful if your husband would let you tear out pages from comic books. - Guillaume loves making lists: lists of ingredients, recipes, behavioral tips, advice, etc. His lists are not always about wonderful, fabulous things. Sometimes he also makes lists of things he doesn't like. I also love to make lists, usually when I'm procrastinating. I wonder if Guillaume ever procrastinates? In short, this book is a perfect kitchen or travel companion that I would never want to damage with sauce or stuff into my suitcase. Be sure to check out the source of this wonderful content on Guillaume's blog on the online version of Le Monde. 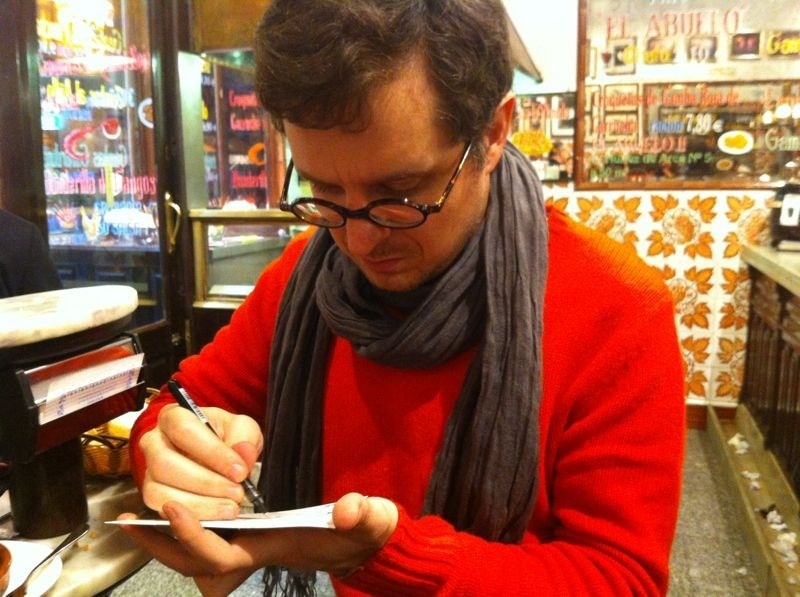 Oh dear, I did just check it out, and the latest entry is apparently what Guillaume took away gastronomically from Madrid. What he doesn't realize is that I have hard photographic evidence of him eating more delicious things while here. Actually, it seems I don't have any evidence after all, other than this photo of him in El Abuelo drawing, not eating, with a whole bunch of shrimp peels on the floor behind him. This weekend I had the dubious distinction of dining at the El Corte Ingles department store in Madrid's Plaza Callao. Department stores are not my ideal settings for lovely dinners, but I was curious to see how the Corte Ingles' new Gourmet Experience area on the top floor of the store in Callao was faring, and the results were actually surprising - especially when it came to StreetXO, the new "street food" joint by two-Michelin star chef David Muñoz of DiverXO fame. Basically, the top floor of this center (which incidentally has some pretty great views) has been turned into a fancy international supermarket with an even fancier "food court". Loud music was pumping out of a variety of establishments serving different types of food (Mexican, noodles, tapas, etc. ), but none was louder than what was coming out of StreetXO. Ready to be disappointed - call me a cynic - I confess that the dishes being turned out by the busy open kitchen sounded both interesting and appealing: "Hong Kong-Madrid Cocido" with char grilled tamarind, taro root and pickled chilies (Cocido Hong Kong-Madrid con tamarindo al carbón, Taro y chiles escabechados); Grilled bone marrow and hake with Kimchi juice and (some sort of) rice (Tuétano y cocotxa a la brasa, Bilbaina y jugo de Kimchee, Gallega de arroz); and "Chili-crab" paprika, chipotles, Palo Cortado (a type of sherry) and mantou (Chilli Crab, Pimentón, chipotles, Palo Cortado, Mantou), to name a few. We opted for the Peking-style chicken skewer and smoked bonito flakes with Tobiko, Yogurt-passion and Chinese five-spice (Espeto de pollo pekinés y bonito ahumado, Tobiko, Yoghurt-pasión, 5 especias chinas), which was delicious, with tender pieces of hoisin marinated chicken that had been cooked three times at different temperatures and then topped with katsuo-bushi flakes, roe, cucumber and pickled red onions. We then tried the Korean rice dumplings with Korean bolognese sauce, Chinese five spice and mandarin orange juice (Ñoquis de arroz glutinoso con boloñesa coreana. Cinco especias chinas. Jugo de mandarinas), topped with thin and crispy strips of pork rind. Both were delicious and left me with ganas to try more. For a standing meal at a bar in a department store, the prices aren't cheap - between nine and fourteen Euros per dish - but neither are the ingredients, and each plate held a laborious - though fast - level of preparation. Unfortunately, the biggest problem with the meal is that, at the end of the day, you are still standing in a department store. On a side note, it was nice to see that El Corte Inglés had diversified the offering of restaurants at its Gourmet Experience. Instead of only featuring the staid chain places or large franchises, one of the other featured restaurants was Malasaña neighborhood pizza joint, Pizza Al Cuadro. It made me delighted for their success to see them included in this project, but a little sad at the same time to see a neighborhood favorite ensconced in a big department store chain. As my companion put it, it's kind of like when your favorite local band goes mainstream: bittersweet. Chicken egg beautifully photographed by my father in Colorado, PhD. Returning to the States for a visit with my family always highlights the many similarities and differences between the country where I live and the one where I grew up. One that never ceases to strike me as interesting is the color variation between Spanish egg yolks and American ones. It might be the jet lag, or maybe I'm just a dork, but I can't get over how much yellower yolks are in the USA when compared to their deeply orange Spanish cousins. So, maybe I'm the last one on Earth to learn this fact, but it seems that the difference is in the diet of the hens and the amount of carotenoids that they consume. These organic pigments are found in plants and other things like algae and some bacteria and fungi. These are divided into two categories: carotenes and xanthophylls (whew. thanks Wikipedia). The former gives carrots their wonderful color (among other things), while the latter refers to oxygen-containing carotenoids such as lutein, which is found in leafy vegetables and as the predominant pigment in egg yolks. So, it can be inferred that a hen that eats large amounts of green leafy plants will get a lot of lutein. However, another factor that many people stand behind is the amount of insects that a hen consumes. 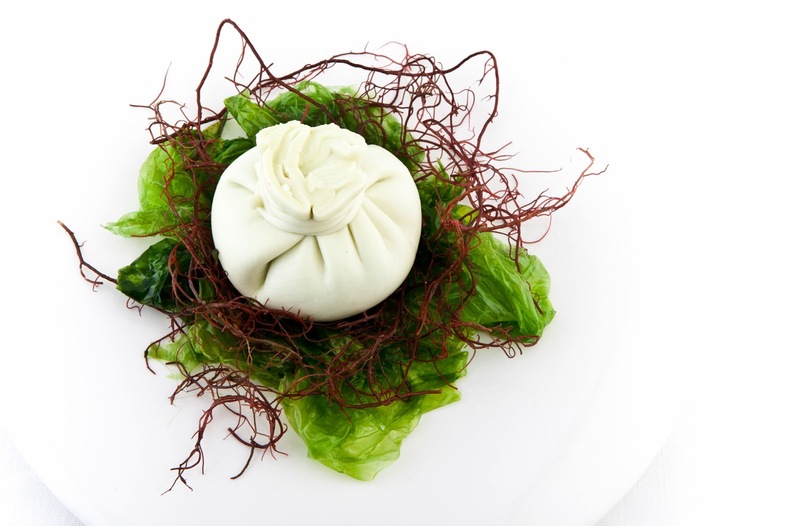 Insect shells also contain carotenoids, which would therefore also contribute to an intense yolk color. and similarly pasture-raised, organic egg that I cracked open here in Spain, are still so different? Or maybe the real question should be, why do I care so much? And the answer, I don't know. I just do.